The south west is the best area of Cape Coral and the 'Eight Lakes' are famous! Watch Manatees or even fish from your own private dock! A beautiful two-story home boasts gorgeous lake-views from all rooms and custom interior designs. This large 3/2/2 house has three large sized bedrooms. So, whether for a single Family or several couples, you won´t run out of space! Additional features including the following: wood-burning fireplace, heart-shaped heated pool, heated spa, a five-head walk-in shower, two king-size bedrooms with TV and a 50' flat-screen TV in the living-room and one bedroom with two twin-sized beds. You can reach Walmart and Publix in 5 minutes. Just minutes to the Gulf! There are a lot of restaurants close by. We are a family from Germany and all four of us are loving America. Every time when we were looking for our next vacation, we were ending up in Florida. We are hoping to spend more time in our house when we will be retired. In all of our vacations over the years we felt very good and we're always happy to come back. During our first vacation in Cape Coral we felt in love with it. 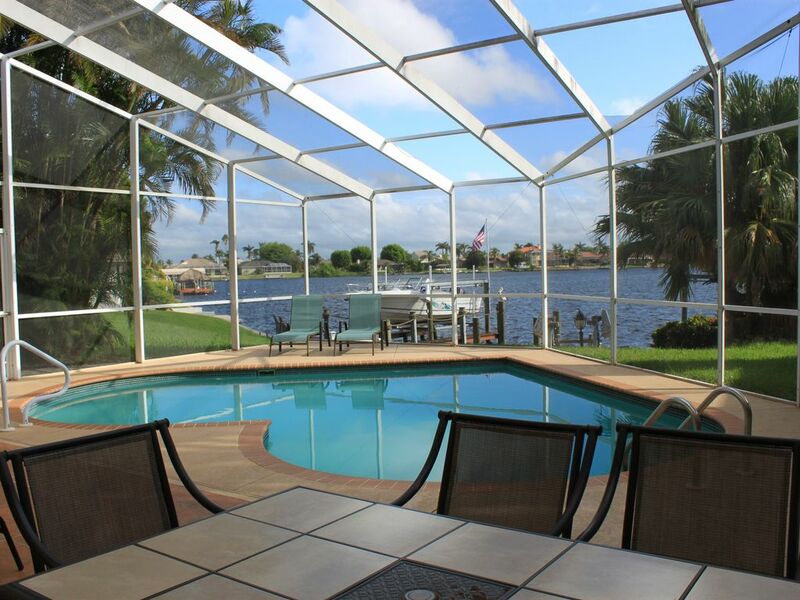 ... and the great veiw to the lake.We didn't miss anything here and therefore we bought this house in the south west area, which is one of the best from Cape Coral. We love the lovely neighborhood with all the beautiful homes around. From the first minute on in our vacation, we felt relaxed and at home. The special look of this huge house with the gallery makes it wide and the gorgeous view over the lake is unforgettable. This two story house has a nice and open floor-plan with large rooms and a large pool area. We created the heart shaped pool by ourselves and love to share our house with nice tenants. wunderful lake view with sometimes dolphins or manatees. You can see the lake from all big rooms. Our house is directly at the lake. There's an own dock to be on the water. There are 3 flat screen TV`s in the house. you can use our bicycles if you like and if they are in order. The house had lots of room, a beautiful pool and hot tub, and great views of the canal/lagoon. Our first evening there, we were even greeted with a surprise visit by a dolphin just 5o feet from the dock! If you plan to stay here, be sure to bring your own dish soap and hand soap, as there was none there when we arrived. The house has been decorated with love and hand painted murals. It was a nice, relaxing stay. Great place for a family to stay and enjoy Florida’s southwest coast! Close to a great deal of local beaches, Sanibel Island, and fort Meyers. Some great parks for hiking and playing nearby. Many great restaurants for dining and the home itself is so relaxing and enjoyable. Our kids loved the pool and hot tub and we had a great time fishing off the dock. Plenty of room for all 5 of us and very clean exactly like the pictures. It was awesome they had baby items like pack n play and high chair saving us a lot of hassle. The neighbors and locals were very welcoming and helpful as well! This home was perfect for a relaxing beach vacation in the sunshine! Great location and wonderful, responsive owner! My husband and I stay at the "Eight Lakes Waterfront Home" in Cape Coral and enjoyed every minute of our stay! The home was spacious and easily accommodated a four day visit from our daughter, son in law and their two children. We loved the incredible view of the lake and enjoyed sitting on the dock to watch the aquatic visitors. We were thrilled when four manatees came right up to the dock and hung out for quite a while. We kayaked the lakes and canals daily and even saw an alligator in the canal! Cerstin, the owner of the home, was excellent to work with. She immediately responded to any questions we had and at the end of our stay promptly returned our deposit. We would love to return to this home someday! My three-generation family of five could not have chosen a more perfect place for five fabulous days under bright blue skies in perfect Florida weather. This tastefully decorated but very liveable home offers a gorgeous view of the water from the screened in pool and hot-tub area. All the comforts of home were available. The Fort Myers/Cape Coral/Naples area has wonderfully clean sand beaches and lovely piers. You will want to explore Sanibel Island and Captiva. And don't forget to visit the Thomas Edison/Henry Ford winter estates, a fun history lesson for the whole family. Lots of great restaurants and shopping are close at hand. And I was extremely pleased with the level of communication with the owner who was very pleasant to deal with. Bottom line: Normally I like to try out properties where I have never been. But I really want to return here on a future vacation. A great winter vacation experience! This is the third year we've fled Northern Illinois during February to enjoy a month of Florida Gulf Coast weather, but the first time we've stayed at this rental location. We were really pleased with our stay in this beautiful home. Our previous rental had a slightly better view, but there is no comparison to the responsiveness of the owner of this property. No matter how minor the problem, we always get a quick and caring response. The location is also great. My wife enjoys cycling and managed to make her goal of 120 miles while we were there thanks to the nearness of Rotary Park and other bike-friendly areas. We walked about every day on the Glover's Bight Trail, which is only minutes away. And you can't beat the Eight Lakes views. A great property and a great owner made for a great winter holiday experience for us! We spent a really good time in this beautiful house. The area is very quiet and supermarkets, stores and restaurants are very close. We especially admired the beautiful view across the lake! Our landlady was always helpful and replied to our questions quickly. We would definitely recommend this place and we might come back soon! The rate is up to 2 people. Add $ 10,- a day for each additonal people - up to 6 people total. $ 0,15 for each kwh Add $ 175,- end-cleaning-fee. Add 11% tax No smoking and no pets in the house! The security deposit is $ 500,-.